Endless Love: All Transistor Model is a 12-hour durational performance/sound installation conceived by Karine Denault, Anna Friz, and Dana Gingras. 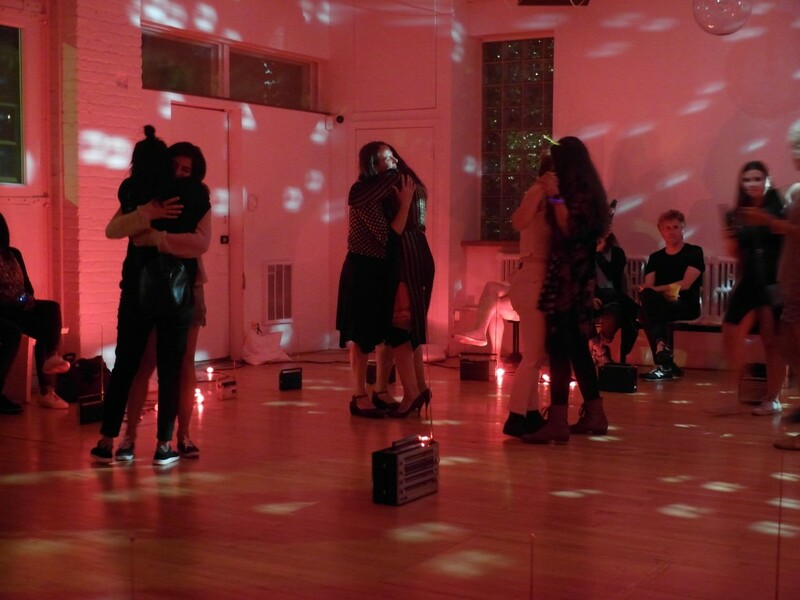 We had a red-lit love-soaked premiere of the work overnight on June 20-21, 2015 from 20:30-8:30, at Stable, Montréal, during the 24-hour art event Endless Love. Two dancers, 30 transistor radios, 3 frequencies, 4 auxiliary audio channels and a giant disco ball, for that immersive full-body love effect. The performers (Karine Denault and Dana Gingras) move through an installation of mid-century AM/FM transistor radio receivers set upon the floor, with four open cone speakers attached to radiators on the surrounding walls. They tune, re-tune, and de-tune across the nighttime landscape and the radio dial, searching for songs of love. They slow dance together, and with others in the audience; they sleep in the radio city troubled by fitful dreams and nightmares; they seek resuscitation and connection through minimal gestures and concrete interaction with the radios and each other. Time lurches unevenly through the night. The heart in crisis requires action, even if union is temporary, fragile, or only glimpsed but never realized. The radio landscape is responsive to the bodies of performers and visitors alike: several micro-watt FM transmitters narrowcast a drunken, time-stretched version of a love ballad, as well as static, textures, heterodyne hums and signals, creating a physical soundscape that is constantly acted on and disrupted by the slipping frequencies and electrical interference between devices and the dancers’ moving bodies. Bodies serve as antennas, and receivers become transmitters. Sound artist and designer Anna Friz further engages the radiophonic field, by changing the scenography of radios and lights periodically from one sculptural ‘set’ to another, as well as modulating and manipulating the incoming and outgoing signals, with a focus on feedback and making the circumstances of transmission audible. 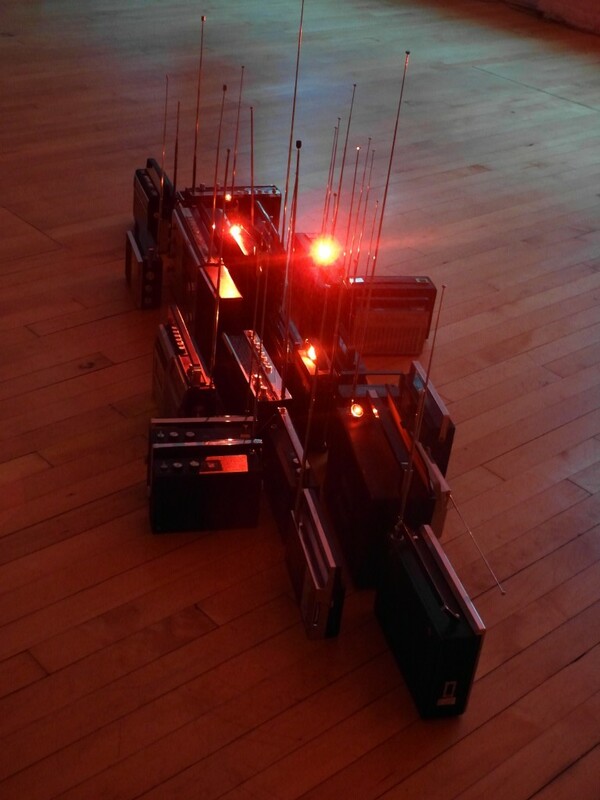 In this way the radios act as the sound system, as the moveable scenography, and as collaborating performers, as the devices themselves produce unexpected sounds.